Now that the Super Bowl is over, and I am done with twelve hours shifts, I can resume my true calling. Yes, I will return to my bitching. Not so much bitching I guess as pointing out a small observation that has grated on my mind for a while. While I don’t read as much as I would like, I do consume a fair amount of fiction. In the past two years it has been crime and noir fiction which has knocked me over the head and drug me to its filthy basement for dark and nefarious things. When writing crime fiction, it is inevitable that bad things will happen to good and bad people alike, and common instruments in such stories are firearms. Over the last two decades one firearm in particular has captured the fancy of law enforcement, criminals, and writers alike. I am speaking of the Glock handgun created in Austria in 1982. I am not here to write a history of the Glock pistol. If you would like to read more about how it became the predominate pistol used by American police departments, I have placed a link below for further reading on the subject. My concern is the propensity of authors to make statements about weapons in their stories that are exaggerated, overcomplicated, or just plain wrong. Being in law enforcement myself, I have spent a great deal of time handling different Glock pistols. I have been issued three different handguns, all of them the Glock model 22 .40 caliber. For back up weapons I have owned a model 27 and currently the Glock 36. The latest model I was issued is the new generation four Glock 22 commonly referred to as the Gen 4. So when I read a good murder scene splattered across the page, you can see why I notice incorrect details involving the Glock pistol the killer is wielding. The offending line that comes in a few variations and throws me out of the story is, “He drew his Glock pistol, thumbed off the safety, and fired.” Maybe it is a failing on my part, but this little discrepancy drives me up a wall. ATTENTION ALL AUTHORS. Glock handguns DO NOT have external safety mechanisms which can be “thumbed” off or on. No Glock pistol not matter the model is made with a traditional safety which can be turned on and off. 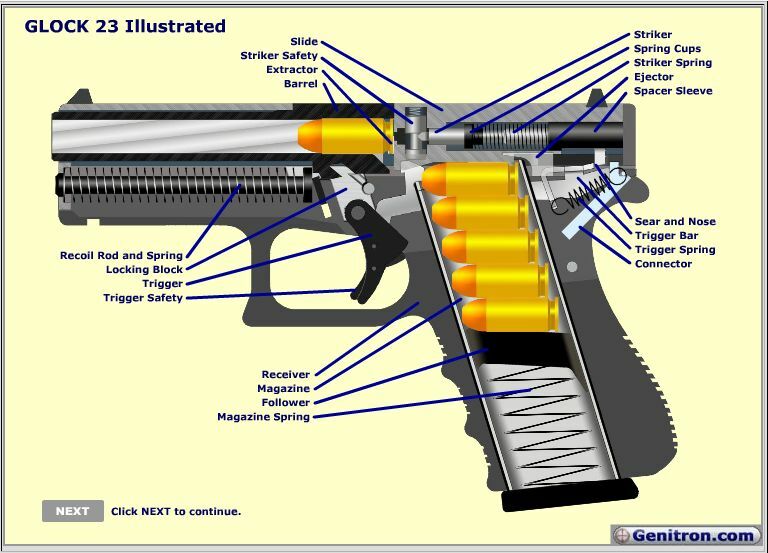 The only safety on the gun is built into its trigger in the form of a tiny lever that must be depressed before the trigger can be pulled and the gun fired. I guess what I am doing by writing this post is pleading with my fellow authors to do proper research in regards to weapons. This is especially important if the story’s main character carries a particular gun or knife that comes into play throughout the tale. My best advice would be to go out and find someone who owns the weapon in question, but if this is not possible find a local gun store that has a firing range. These ranges often will provide a variety of guns to rent to prospective leisure shooters. Often they will even have fully automatic weapons to rent, although the cost of ammunition will cause the cost of the rental to sky rocket when firing on full auto. At bare minimum get online and read up on the guns your characters will be using. Do a search on youtube, and watch people shoot the gun in question. Many times you will be able to find instructional videos on youtube that show how to load, fire, unload, and clean all manner of pistols, rifles, and machine guns. It is a matter of a few minutes of research and will keep nuts like me off your back. A little research into the effects of ballistics would be advisable as well, but that is a subject matter for another post. Remember, it is impossible for your character to thumb off a Glock’s safety because they don’t exist. This entry was posted on February 11, 2012 at 2:47 pm and is filed under Uncategorized. You can follow any responses to this entry through the RSS 2.0 feed. You can leave a response, or trackback from your own site. Excellent advice, no matter the genre you choose to haunt. Reblogged this on Veronica The Pajama Thief. You and me both CJ! If you’re going to talk weapons. yes, the details matter. Otherwise in my humble opinion you are talking out your a**. As I commented to a friend of mine a couple of weeks ago: “If you come into a crime scene and smell the cordite” — frequently misspelled as chordite — you are smelling a propellent that was last manufactured in the 1930s. The last military use of that propellant, I believe, was in the trigger of the second atom bomb that was dropped on Nagasaki, so some very old ammo was used in your crime scene. I’d start looking for Ninty-year-old bad guys with ancient weapons. And please don’t get me started on the “clip vs magazine” thing. Thanks CJ for a very well written and really needed piece. Thanks AJ! I actually have used the word clip in a story, but only because the character in the story would have called it that.